This F. Earl Christy painting was created for use as a calendar in 1915 for the American Artworks Company of Coshocton, Ohio. There were twelve different images, one for each month of the year, and each with a beautiful young girl holding a trophy she had won in a competition. The calendar print for this image is titled, "Aeroplane". In 1915, few people had actually seen an aeroplane fly. In 1912, Harriet Quimby, a writer for "Leslie's Illustrated Weekly" magazine became the first female to fly across the English Channel. At the time, many people were fascinated that a woman could do such a thing, thus she became famous. She was known for creating her own purple satin flying suit. 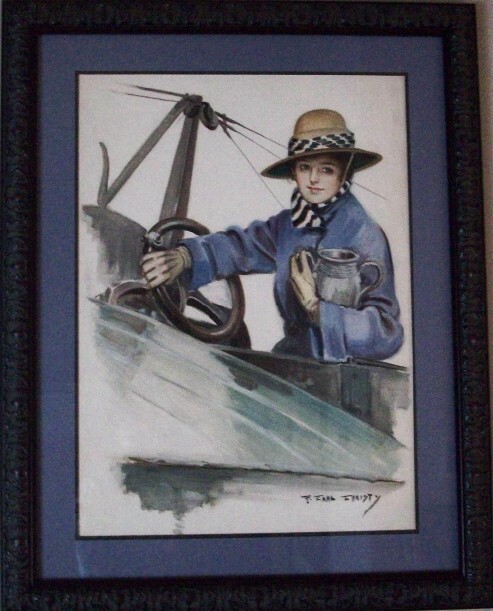 This image is not Harriet Quimby, but perhaps Earl Christy was making it known that a woman could achieve anything, if she set her mind to it. It can be noted that both Christy and Quimby both had ties "Leslie's Illustrated Weekly" magazine. F. Earl Christy was born in Philadelphia, Pennsylvania in 1882. The "F" is believed to stand for "Frederic". At 17, he painted originals for the Boardwalk Atlantic City Picture Company, with many of his early works published by the J. Hoover and Sons Calendar Company of Philadelphia. He attended the Pennsylvania Academy of Arts from 1905-1907. Christy produced dozens of magazine covers including; Dell Publishing Company for "Modern Romances", "Modern Screen" and "Radio Stars",Ainslee's Magazine", "American Magazine", "Sunday Magazine" of the New York Times, "Collier's", "Leslie's Illustrated Weekly", "Liberty" magazine, McClure's "Photoplay" magazine, and "Puck" magazine. He also created illustrations for many calendar prints, ink blotters, postcards and Princess Pat Cosmetic's advertisements. Most of his images were of beautiful girls primarily playing sports such as basketball, golf and tennis. Earl Christy never married and lived most of his life with one or both of his sisters. He passed away on Long Island New York in 1961.